Listed below is a sample of my 2016 Linebacker Rankings for IDP Redraft Leagues. I will update these sample rankings periodically during the off-season to reflect changes in free agency, defensive schemes, playing time, draft selections, etc. 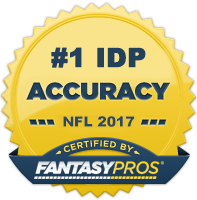 However, keep in mind that the information listed here is just a small sample of a much larger set of rankings and descriptions that are accessible through purchasing my 2016 IDP Fantasy Football Draft Guide. The fact is that there are a plethora of potential LB1 linebackers (e.g. Trevathan, Marshall, Perryman) that can be had rounds after the Tier 1 and even Tier 2 linebackers are off the board. Additionally, IDP studs always emerge at the linebacker position throughout the season (e.g. Malcolm Smith). So often times the best strategy is to wait until the upper echelon linebackers have been taken and then come in and start plucking up the potential LB1 upside value plays a few rounds later. This will allow you to use those early round draft picks to shore up other positions such as defensive line where more relative value is to be found, while at the same time, not suffering significant losses of quality at the linebacker position. 1. MLB Luke Kuechly (CAR) - Kuechly was a stud in nearly every defensive facet last year. Despite missing four games due to injury, he was still a top five linebacker and led all linebackers in points per game. He's got a pretty good stranglehold on the top fantasy linebacker position and should likely be the next defensive player taken off the board after JJ Watt. 3. WLB Lavonte David (TB) - David was fantasy's top scoring linebacker a year ago and remains one of the most dynamic flow and chase backers in the NFL. He gets a slight bump down under Bowman however because he will likely get some points taken away by Kwon Alexander this year. Still an elite LB1 though. 4. MLB Alec Ogletree (LAR) - With Laurinaitis gone to New Orleans, Ogletree is now the focal point of the Rams' defense and will be moving to middle linebacker. He's hovered in the LB2+ range for the first three seasons of his career, but I expect him to catapult into the LB1 tier in 2016 especially if the stat crew becomes more favorable with the move to LA. 5. ILB C.J. Mosley (BAL) - Mosley was a solid LB2+ in 2015 and with veteran Daryl Smith no longer in the picture, he's firmly planted in the LB1 group. He doesn't have much tackle competition around him and should be a fairly safe bet for 120+ total tackles and few sacks. 6. ILB Jamie Collins (NE) - Collins is perhaps the best big play linebacker in fantasy. He registered 5.5 sacks last year in just 12 games and is a candidate for 6-8 sacks over a full year. He struggled with consistency in the tackle department but the upside is there. If you can handle some slight swings in weekly production, Collins is well worth a selection in the top 7. 7. WLB Telvin Smith (JAX) - Telvin Smith was as consistent as they come in 2015 - never posting less than 5 solo tackles in any game. Posluszny is on the downturn of his career and Myles Jack will be somewhat limited on the strong side, so Smith should continue to be the Jaguars main tackle producer for at least one more season. For those in tackle-heavy leagues, feel free to bump him up into the top 5. 9. D'Qwell Jackson (IND) - With 150 total tackles, Jackson was 2nd only behind Navarro Bowman for the league lead in the category. He's 32 years old and has lost a step over the last couple seasons. But with Jerrell Freeman leaving and Sio Moore adjusting to his new role at ILB, Jackson should continue to see a crazy amount of tackle opportunity. Even if his on-the-field performance continues to decline, his production should remain steady.